Editor's Note: The book "Living on the Edge" by Jonathan Burke is due to be published in November 2013, but excerpts from the book are being published at the Facebook page. I'll be mirroring them here. Put simply, confirmation bias is our natural tendency to look for information which confirms what we already believe, and ignore or reject information which disagrees with or conflicts with our beliefs. When choosing between two sources of information, we tend to place greater confidence and value in the source which confirms what we already believe. The 17th century philosopher Francis Bacon described this tendency in his book ‘The Advancement and Proficience of Learning Divine and Human’ (1605), noting that people are more strongly influenced by information which confirms (or affirms), their beliefs, than information which contradicts (or negates), them. This is a dangerous tendency because it erodes our capacity to think critically, and to examine our own beliefs for error. One way to help guard against it is to seek out arguments by those who disagree with our position, reading their criticism and counter arguments. Another way is to present our case to readers who are neutral or even biased against our case, to see how it withstands criticism by those who can look at it without our personal bias. This is a key strength of the peer review process. Govier, ‘A Practical Study of Argument’, p. 106 (2009). Bacon, ‘Advancement of Learning’, in Creighton (ed. ), ‘Advancement of Learning and Novum Organum’, p. 321 (rev. ed. 1900). This is a complete joke. If there is one thing that Jonathan Burke and the Berea-Portal team (B-P) don't do, it's to discuss with those who challenge their beliefs. Have you ever seen them comment here at the heart of the Christadelphian Unbeliever opposition to Christadelphian thinking? No. Have you ever seen any sensible debate on one of their sites with an Unbeliever? No. Why? Because they ban people like me for daring to argue the case that they are wrong. The B-P websites are a psychologist's dream come true for displaying the entire spectrum of different Cognitive Bias's; particularly Confirmation Bias. You could write a PHD on the rampant Confirmation Bias shown by the B-P team. "Rob I appreciate your intellectual and moral honesty. There are plenty of us who wrestle with the same doubts and questions, and I'm sure you're well aware of this. I would be deeply concerned if none of us thought critically about our faith. As you are aware, a number of us have been working together for some years, addressing the issues collectively in ways which are far more effective (though far more demanding), than struggling alone. While I understand and respect the path of questioning you undertook, I don't believe you went about it the right way. I'm saying that not as a personal criticism of you, but to encourage others to understand that your decision to question and investigate was not wrong. It was right; I just disagree with the way you went about it. There is a better way, and I want to encourage others to take that path." - See what I mean? 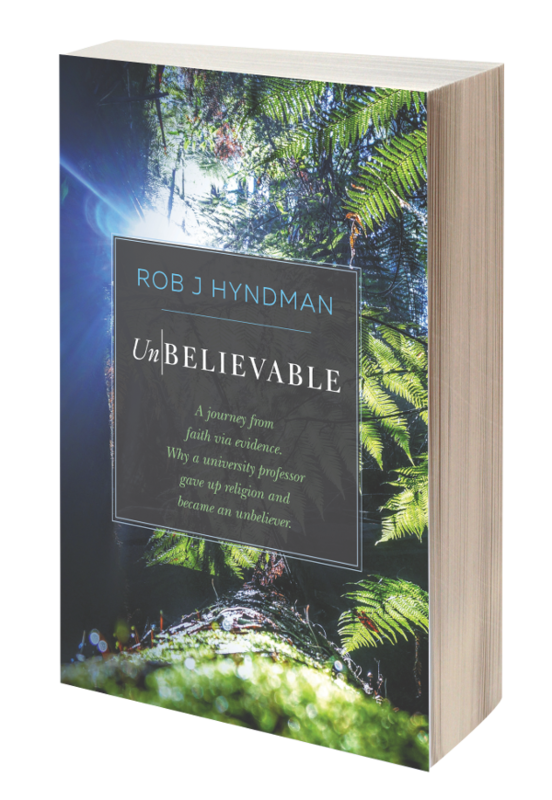 He told Rob that he was wrong to have struggled with his weakening faith alone. Instead he should have discussed with the Berea-Portal team where they could have bolstered his faith with injections of Confirmation Bias. Thankfully he discussed with me instead; where he was free from the pressure of B-Ps to ensnare him back into the religion. Did I seek to influence him away from the religion? No. Eight weeks before he resigned, my wife Allison and I emailed him to tell him to stay in the Christadelphians for the sake of his marriage. Only today I wrote in a comment on this website to a B-P (String Player) that he should write articles here and that any member of the B-P team were welcome to also write articles here. Not comments - proper articles. That's how free I am from Confirmation Bias. That's how confident I am in the truth of what I am saying on this blog; that Christadelphian thinking is wrong. I WANT talented Christadelphians to write articles on this blog so that we can discuss and debate to find the truth of these things. Robust debate and peer review are at the heart of the scientific method of making discoveries and exposing error. But robust debate and peer review by brethren who don't agree with them are anathema to Jonathan Burke and the B-P team. The result is their nervous lack of confidence, bordering on paranoia, in dealing with the opposing team. The result is their fragile, weak faith that is untested in the heat of battle. The result is the deconverts who are leaving the Christadelphian faith because both the CMPA at one end of the spectrum of Christadelphian intelligence and B-P at the high end of that spectrum, have let them down so very badly. In vain they have sought to use Confirmation Bias to trap them in a religion that has decomposed into Fideism. 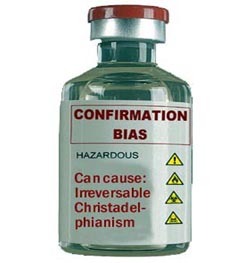 See my longer article on Confirmation Bias. Click here.